The view from further down the oil supply pyramid – de-growth probable – an interview with Gail Tverberg. Southland NZ implications. An edited transcript of an interview on the Extraenvironmentalist Podcast, Episode #55. If you’d prefer to view the video interview that this excerpt is based on, you can watch it here: http://bit.ly/ZekRDz. After the transcript, some potential ideas as to how to put this into effect for Southland NZ are added. Seth: Gail’s been in this peak oil scene for a long while, and she’s watched the whole scene play out. And being an actuary, she knows how to look at the numbers and see where the risks fall, and it’s very interesting her perspective that she comes from. Gail: One kind of response is to kind of agree, but then put it out of your mind and say, “well, maybe it will happen to my grandchildren,” or something like that. Or maybe “she just doesn’t know what she’s talking about.” I think that the people who are closer to a situation, maybe the other actuaries for example, they look and they say, “Aha! I think she’s got something there.” Well, when I talk about the oil situation, I think I explain it a little bit differently than what a lot of people understand. The way I see peak oil is different. The way I describe things is sort of in terms of a triangle of resources, and the way I see things is that we start at the top of that triangle, and the resources at the top of the triangle are the easy-to-extract, cheap oil. We started there a long time ago, and most of those are already extracted. Then we have to move down and we get to the little bit more expensive, little harder to extract oil, or maybe a little farther away, or maybe not quite as good a country that’s got a good political system. Figure 18. Oil and Gas Resource Volume Versus Resource Quality. 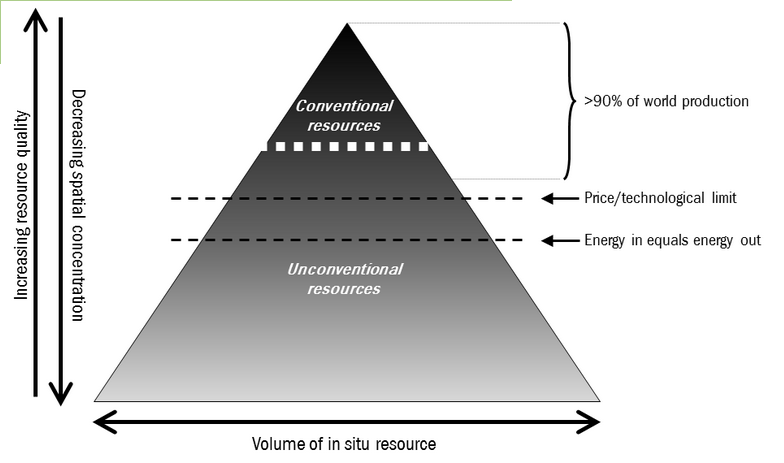 This graphic illustrates the relationship of in situ resource volumes to the distribution of conventional and unconventional accumulations, and the generally declining net energy and increasing difficulty of extraction as volumes increase lower in the pyramid. Source: "Snake Oil: How Frackings False Promise of Plenty Imperils Our Future"
We keep going down the triangle, and there always looks like there’s lots more oil there, but what happens is the more oil that’s there, it’s harder to extract. It’s more expensive to extract and it disrupts the economy. It’s not the cheap oil that our economy started with when the economy was first set up. So it tends to lead to recession.This was never factored in. People who are looking at the situation just look at the big triangle and say, “My! There’s lots and lots of oil down there.” Yeah, there is lots and lots of oil down there, and that oil may permanently stay in the ground because it’s so expensive to extract and it causes so many economic problems. When we do extract it, we really can’t afford to extract it. Well, I think what happens is that the oil prices don’t necessarily go up all that high. In fact, I think what we’ve been seeing is exactly what happens. The price goes up a little, but what happens is that you start getting debt defaults. It goes up and you start seeing the situation like we had in Europe. Europe is a little bit different than the United States because in the United States, we’ve got cheap natural gas which is kind of helping us along to kind of offset the high price of oil. But in Europe, they don’t. They’ve got high-priced natural gas besides high-priced oil, and they’re the ones that are going to be hit worst by the debt defaults. But I think that the way this all evolves is through debt defaults from the high price of oil, and we’re going to see Greece and maybe we’ll see Spain – I think we’re also going to see some kinds of situations in some of the oil-producing countries, for instance Egypt, the countries that find that they’re out of balance as well. And we’re going to see bad financial situations there too. It’s not just in Europe, but the way this all plays out as peak oil, what it looks like is financial collapse. I think a big piece of the reason why the economies of Greece and some of these other countries are falling apart is because they are such big oil importers, such big users of – they’re so dependent on fossil fuels. I think Greece is actually coal that they’re using a lot of, but what happens is that as the prices increase, the tourists, for example, are not able to travel as much, so it cuts back on the tourist packages that they were selling. And so things don’t go as well. They lay people off of work, and you start seeing the recession that we see, and the taxes aren’t high enough to pay the benefits that they’ve promised the laid off workers, and you start seeing the pattern that we see today. I think what we’re going to see coming ahead from what is being called peak oil, but I guess it’s really the high oil prices is we’re going to see more and more of what people will think of as financial collapse. And that’s going to be happening around the world. It probably will start in Europe, but it’s going to spread to the United States. It may very well spread to China. It is going to have an impact on places like even Africa too, because they are depending on us for some of the exports that we send them as well. Transcripts of the other interviews from this 2013 ‘degrowth’ episode are being released following on from the 2014 degrowth conference in Leipzig, to keep the buzz going, and stimulate further conversation. For a playlist of the video recordings from the live sessions from Degrowth Conference 2014, click here: bit.ly/degrowth2014_sessionsplaylist_ee. New Zealand is in many ways exceptional when considering Peak Oil. It has its own oil and gas supplies, which at the time of writing are producing enough liquid fuel to support around 70-75% of our current needs. However, our current proven reserves are subject to the same eventual declines that we’re seeing globally. Recent efforts to find further productive wells in risky deep sea locations are so far proving fruitless. Reliance on the same strategy as in the USA – massive expansion in fracking activities – is both a short term strategy only, and also dependent on huge capital expenditure which has to be debt financed. “The world’s leading oil and gas companies are taking on debt and selling assets on an unprecedented scale to cover a shortfall in cash, calling into question the long-term viability of large parts of the industry. “So far this week, oil prices in New York and London continued the collapse that has been going on since mid-June. New York futures closed at $91.67, after hitting the lowest intra-day level since May 2013, and London closed at $98.18, the lowest close since April 2013. As has been the case for several months, the markets are seeing too much production and too little demand. US crude output hit a 28-year high last month and Libya’s National Oil Company is saying that Libyan production is up to 800,000 b/d, despite the turmoil in the cities. Yeah, the big news right now is that the industry needs prices higher than the economy will allow, as you just outlined. So we are seeing the major oil companies cutting back on capital expenditure in upstream projects, which will undoubtedly have an impact a year or two down the line in terms of lower oil production. That is why I think that Campbell and Laherrère were right on in saying 2015, 2016 maybe, we will also start to see the rapid increase of production from the Bakken and the Eagle Ford here in the US start to flatten out. And probably within a year or two after that, we will see a commencement of a rapid decline. So you know, on a net basis, taking all those things into account, I think we are probably pretty likely to see global oil production start to head south in the next year or two. But this change in capital expenditure by the majors, that is a new story. You know, just a couple of years ago, they needed oil prices around $100 a barrel in order to justify upstream investments. That is no longer true. Now they need something like $120 a barrel but the economy cannot stand prices that high. So you know, if the price starts to go up a little bit, then demand just falls back. People start driving less. And so the economy is unable to deliver oil prices to the industry that the industry needs. This is—I think Gail Tverberg is saying this is the beginning of the end. I think she is right. In NZ, we are geographically dispersed, and heavily dependent on oil supply in our economy. Furthermore, we produce none of the electronics, etc that will be unavailable if disruption in globalised supply chains occurs. We are now so dependent on fossil fuels and electricity that any collapse that does take place seems likely to be faster than prior collapses. If the electric grid goes down in an area, and cannot be repaired, most business functions will be lost – practically immediately. If oil supply is interrupted, it also will bring a halt to most business in an area, because workers can’t get to work and raw materials cannot be transported. How do we address these risks? I think that’s a really good starting point, and will hopefully point central government, and in time, local government, in the right direction if it is allowed to inform policy decisions. However, in the meantime, and because we may not have that much time, I feel it’s imperative for local government, particularly the likes of our regional economic development body to consider putting some money into heading in the right direction, aside from central government directives. That direction acknowledges that; the oil won’t be with us forever, that it will be very difficult to ‘adapt’ at the point of crisis, and that ‘degrowth’ in economic activity is a reality we’re facing far sooner than the mainstream media will admit (with some notable exceptions: http://bit.ly/1pKHXZx http://bit.ly/1zhiyNW). In Southland, we have some of the most productive farmland in New Zealand, and it’s possible that given our low population density and remoteness from nuclear facilities (try managing the waste at those locations successfully, without the high energy budget we currently are squandering…), that we have the potential to be a place where humans can continue to thrive. ” 3. A love/hate relationship with risk. It’s a paradoxical idea, but one way to build resilience, or antifragility, is to keep the vast majority of the business as safe as possible, but then take big risks – ones that may pay off 10-fold or more – with a smaller part of the business. We already have some independent economic analysis supporting this general direction in the form of the BERL report from 2012: http://bit.ly/1qpuVVU http://bit.ly/1qpwP8O and Venture Southland continues to explore these possibilities: http://bit.ly/1qpv5N4, however, the content of the major development initiatives as outlined in the annual report http://bit.ly/1qpvsHd is mostly lacking in this type of thinking, despite my submission suggesting some potential avenues to explore http://bit.ly/1sTdmeB.